I caught up on all my work at Saddleback and another nice spring day was forecast with high’s in the low 70’s. 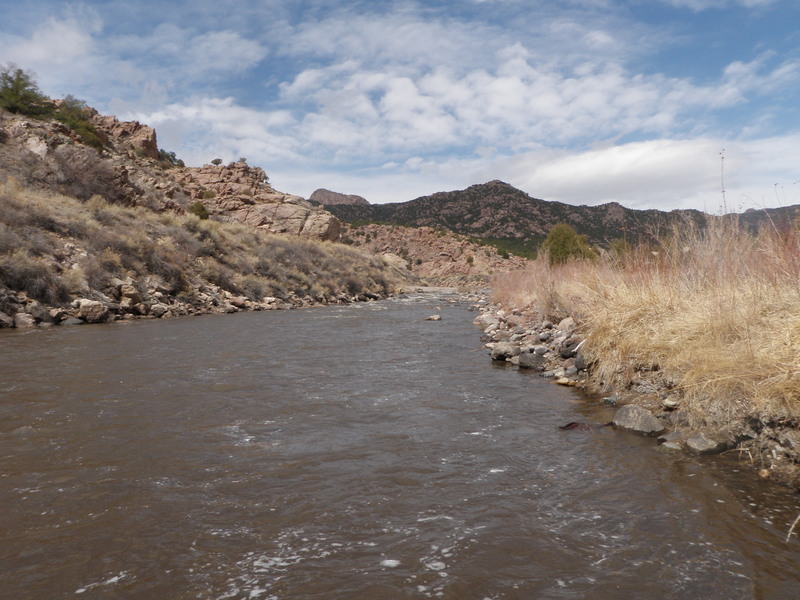 I was able to get an early start on Wednesday, so I read the report on the Arkansas River. It sounded encouraging with the potential of a BWO hatch, so I decided to make the trip. I stopped at the Royal Gorge Angler and purchased four golden stonefly nymphs recommended by Bill Edrington, the owner. 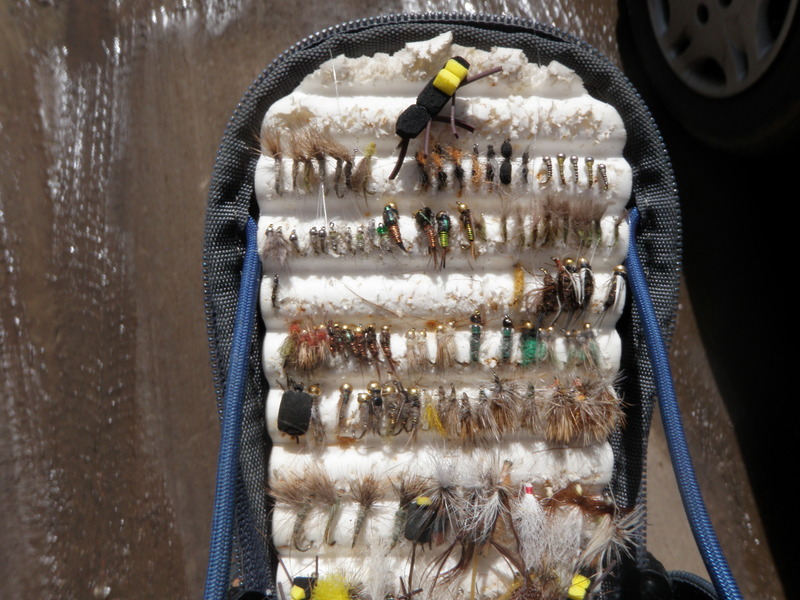 Bill said the golden stoneflies were molting and fish were taking them at the top of pools. He advised to switch to bright green caddis pupa and BWO nymphs in the afternoon. He also cautioned that the river had quite a bit of discoloration. This should have been a red flag. 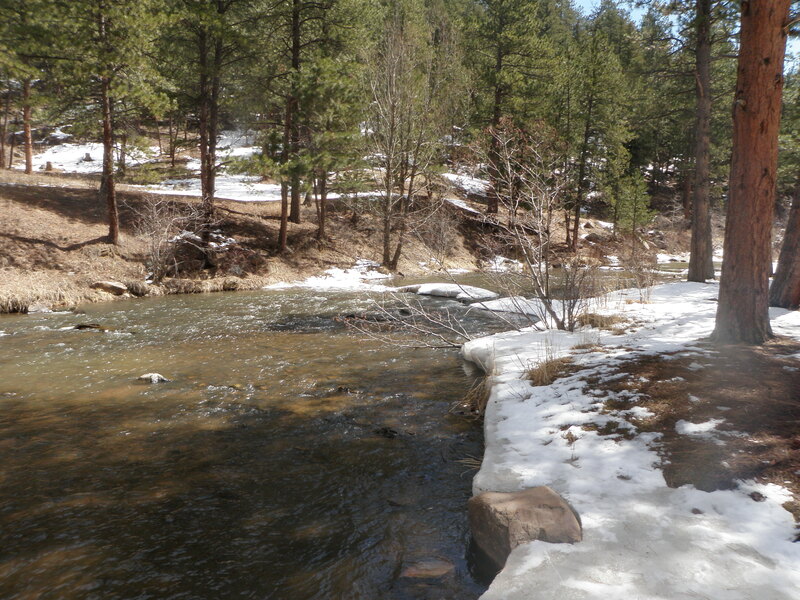 I drove to the area above Pinnacle Rock where the river splits into four channels. Quite a bit of discoloration was an understatement. The river was the color of dark olive split pea soup. 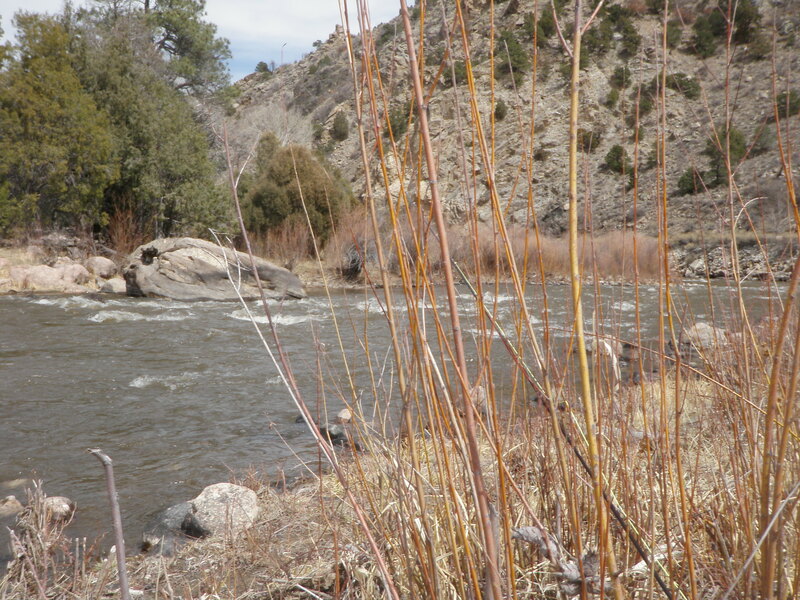 Visibility was 6 inches at best in the riffles and along the edges. I rigged up and tied on the chenille rubber leg stonefly nymph I purchased and trailed a beadhead hares ear and began working the top of runs with a strike indicator. I did this for an hour and a half in some nice juicy deep runs to no avail. I walked back to the car to eat my lunch, but decided to drive to Texas Creek and check out the water on the smaller tributary. Texas Creek was raging and murky, so I returned back to the braided stretch and ate my lunch. After lunch I waded across two channels to get to the nice northern most run which historically is one of my favorites. The water was discolored, but not high, so I switched to a yellow Letort hopper trailing a beadhead hares ear and beadhead RS2. This produced nothing in some nice riffle stretches that normally hold fish. When I got to a third nice stretch of water, I replaced the flies with a glass bead caddis nymph followed by an emerald caddis larva fly. I finally managed to hookup with a small brown, but as I set the hook and lifted, the fish turned its head and got off the hook. I worked my way upstream some more hoping to see a BWO hatch. When I reached a point where the streambead narrowed and the water wasn’t as enticing, I decided to walk back to the bottom of the north braid and rest on a log and observe the water in hopes of a BWO emergence. I lied down on the ground with my head propped up on a log and dozed off. I woke up and discovered I’d taken a 45 minute nap and it was 2:45. I decided I’d had enough fun and returned to Denver. 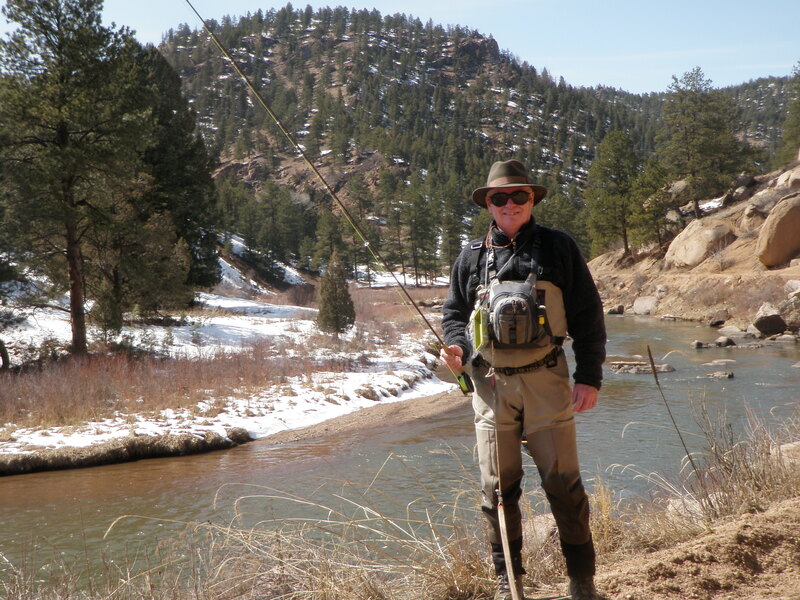 With temperatures finally forecast to reach 60 degrees, I decided to visit the South Platte River downstream from Deckers on Sunday. Jane agreed to accompany so we packed a lunch and left the house around 10AM. As we drove from Sedalia there was a lot more snow on the hills, and we were concerned about the condition of the steep Nighthawk Hill. 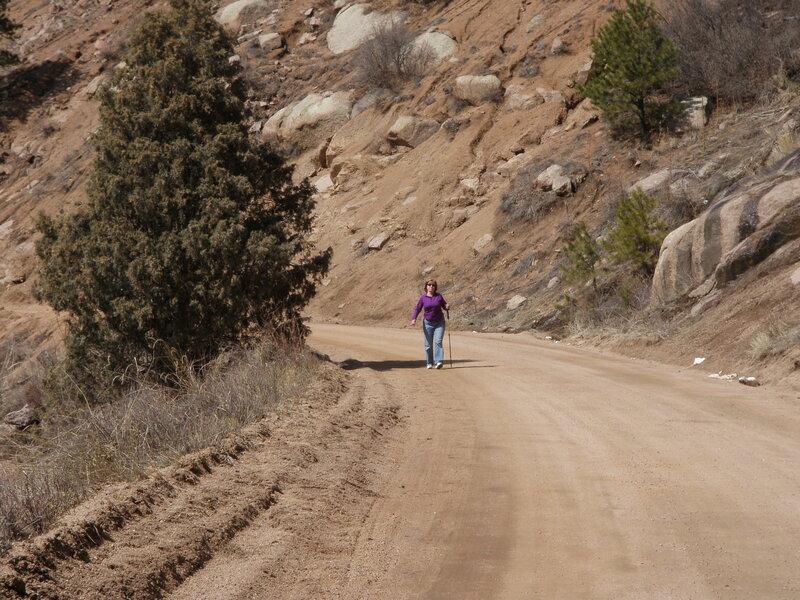 When we turned on to the dirt road at Sprucewood, we could see it was packed dirt and mud, so we made the descent and turned right and parked at the Whale Rock parking lot. It was still chilly when I began, so I had on a fleece top over my fishing shirt. 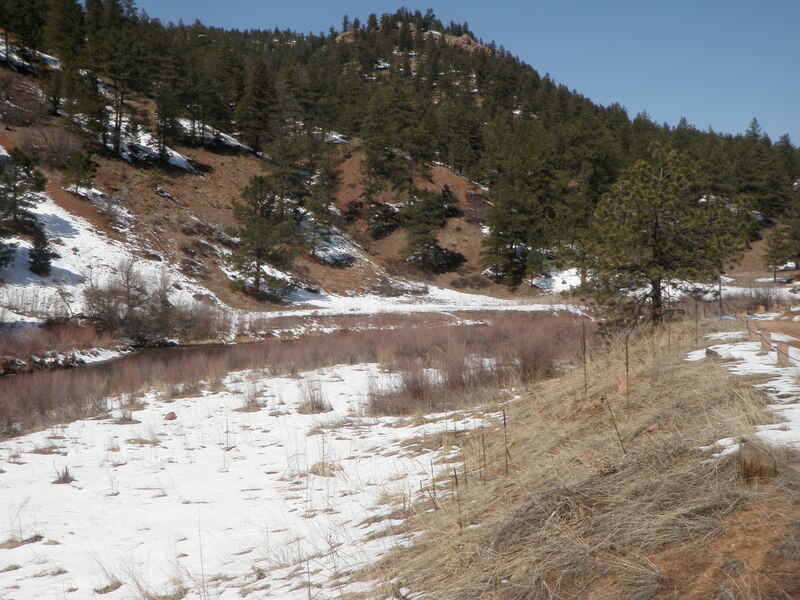 I walked down the road beyond the parking lot then cut some footprints through the snow on the relatively steep bank and approached the river. 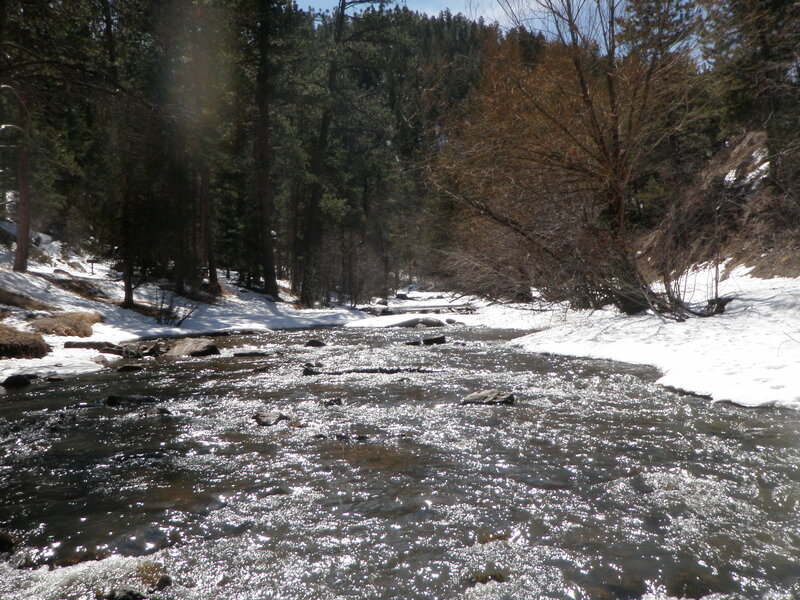 The river was running at a nice flow, probably 200, and mostly clear with a tinge of color from the nearby snowmelt. I rigged up with a strike indicator, split shot, San Juan worm and beadhead hares ear to start. I covered a fair amount of water with no action. I was constantly clearing moss from both the flies. But after 45 minutes of fishing, I caught two small browns in some 3 foot deep riffle sections. The first brown grabbed the San Juan worm and the second took the BHHE. I continued working my way up along the roadside bank, but to no avail. 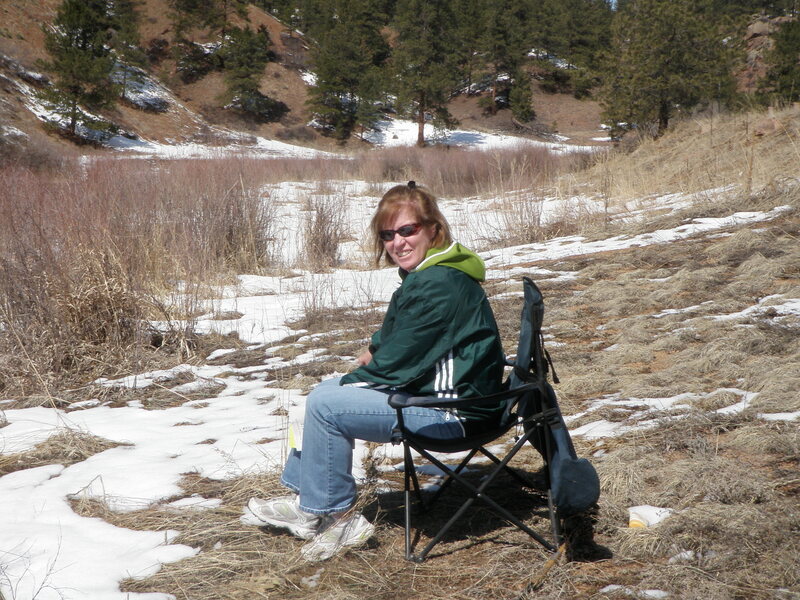 I quit fishing at around 12:30 and climbed the bank and walked back to the car where I found Jane reading in her chair with her hood pulled up due to the wind. 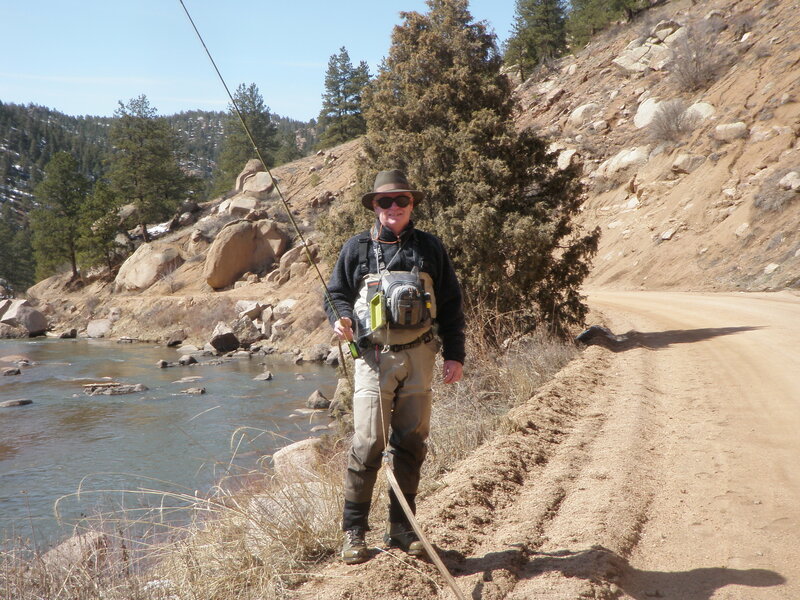 I ate my lunch and then decided to hike up the road beyond the next parking lot, and fish the rocky stretch that borders the road where I’ve had much success over the last several years. I knew there were fish in this area from past experience. Jane decided to drive the van to the next parking lot and read there. I cut down the short steep bank to the river above a large boulder and fished the first deep run with the nymphs with no success. I moved up to the next pool/run and switched my flies to a Chernobyl ant trailing a BHHE. The next series of pools were shallower so I felt the dry/dropper could fish deep enough. I didn’t have any success in the next pool, but in the third pool, I caught a 9 inch brown on the BHHE. 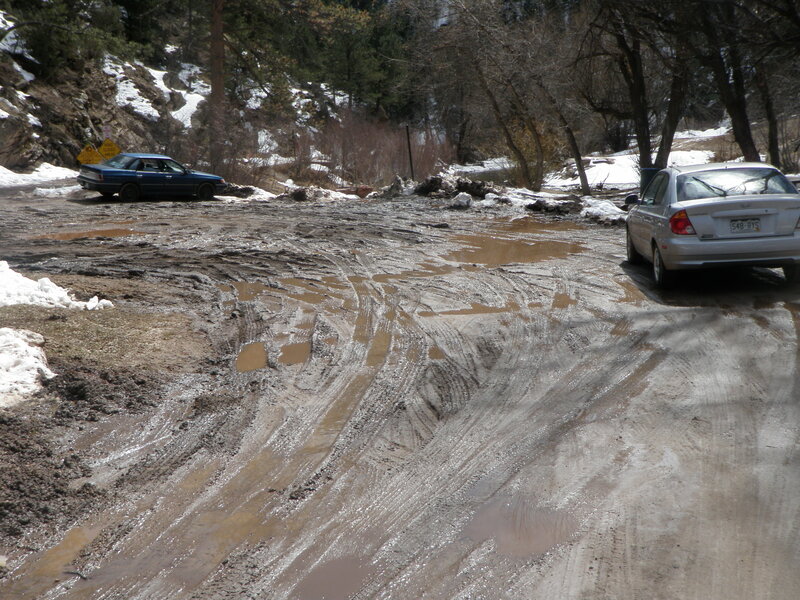 I continued working the remaining attractive water in this manner along the road and then around the bend and through a riffle stretch until the river came up close to the road again. I had no success in this area, although another fishermen and his young son came down this stretch with spinning rods, and this may have spooked the fish. There wasn’t a cloud in the sky, so the likelihood of a hatch was remote. I spotted only occasional midges in the air. I was growing weary of the lack of action, so we called it quits at around 2:30 and returned to Denver.